On the eve of Halloween, I have a very special treat for my readers & visitors – especially those who are following #SpooktasticReads this year – as @WyrdAndWonder kicked-off our first mini-event which played against a theme of spooktacular stories befitting being read throughout October and leading straight into the last 13 days til Halloween! It is a spookified time of the season – a time where there are veils being revealled between worlds, where the paranormal & supernaturally inclined readers dig into thrilling suspenseful reads whilst our favourites from years past run on our televisions as both serial tv and motion picture haunt us or thrill us depending on the story we’re watching take over our mind on the screen! These are the days where digging into the darker realms is part folly for course and where all of us try to keep ourselves rooted in the Light even if our imaginations start to run a bit more wild on the edgier side of Literature and Film! What drew me to this story is the premise of course – as all stories first have to capture my heart & give me something fittingly unique to be reading. A character arc andd journey; a dramatic revelation expected, a cheeky relationship being built despite mistrust & the curious ways the heart flutters despite our head’s intention to keep us distant and of course, the interplay of the world-building itself – of how this is a bridge into a realm I already love (Steampunk) to cross itself into #VampireRom (a new PNR interest of mine since I first read ‘Dance Until Dawn’) and a dash of werewolf lore I’m still sorting out how I feel ever since I was emotionally overwhelmed by ‘Twilight’ during Nanowrimo, 2008! I previously disclosed my appreciation for PNR stories whilst I was highlighting a Dark Fantasy novel about the fey – another selection I felt was fitting for #SpooktasticReads. The curious bit of course is how despite my reservations about dipping into the realms of Vampires & Werewolves – there are certain authors who intrigue me. Either by writing a genre-bender (such I would consider this one to be) or by giving such a hearty premise of cross-appeal that for a reader like me whose on the *fence! * if she can walk into this darker realm of Paranormal Romance (PNR) it is something to consider – as there are keen elements of what I do love to find in a story of this nature. The cheekiness of humour, the world-building aspects of the dimension explored, the interplay between the lead & secondary characters, the potential drama evolving into the forefront of the story itself and of course, those ‘elements’ which happily reside within the scope of the paranormal. The ones which are not as easily defined and have their own perimeters of existence. As previously declared this is October – a time for finding #SpooktasticReads & the stories which might take us outside our comfort zones a bit whilst we embrace the spookier side of literature! I love Gothic stories & I do love the paranormal – sometimes I find myself drawn into stories which might tempt me past my own conclusions of how dark I want to read darker Fantasy & Science Fiction (or rather, Spec Lit in general without a definitive branch inclusively declared) and sometimes, I find a gem unexpectedly in a sea of choices, where a story can stand out, grab my eye and encourage me to ‘dive into the unknown’ – this novel felt like the kind I ought to take a chance on and I am thankfully blessed to be highlighting it through this conversation during our #WyrdAndWonder mini-event – this one just felt wicked fascinating! (*) nearly all of the London Steampunk series is available in audiobook as I happily found them via Scribd which is where I was able to listen to the opening chapter(s) of Kiss of Steel and look forward to listening to more of the story. I am hopeful more of this duel series goes to audio eventually or becomes released into print – though I am partial to audio due to what I heard thus far. This is a predominately Digital First series – straight to ebook. Dukes Are Forever (book five) | *title forthcoming! Book Blitz | “Love Overcomes” by Angela Schroeder A new #INSPY #Romance by an #IndiePub who seeks out a sweeter side to the genre I personally love to read! Chapter Samplers for her Contemporary Romance “Love Overcomes” was provided for free download by the author, Angela Schroeder via her Smashwords Author’s Page. The samplers are complimentary of the author, Ms Schroeder to encourage readers to become familiar with her writing style for Contemporary Romance ahead of purchase. I was not obligated to post a review nor share my opinions of the chapter samplers I downloaded; as I elected to do this for my own edification. I did not receive compensation for my opinions or thoughts shared herein. I was selected to be a tour stop on the “Love Overcomes” book blitz through Lola’s Blog Tours. I did not receive compensation for my opinions or thoughts shared herein. If you spend a bit of time with me on Jorie Loves A Story, you’ll find a heap of commentary on my bookish blog reflecting my hybrid readings and adventures taking me across literary divides whilst enveloping me inside both mainstream and INSPY markets. It is quite the happy day when you can discover not only a ‘new-to-me’ author but one who knits together a sweeter side of a genre I personally have loved for absolute ages! I love relationship-based Romances (irregardless of which section of the genre they take up a niche inside) and when I first read the synopsis for this one, I felt as if it was a bit unique in it’s conception and a read that would interest me if it were available in print. I have started to become a bit more organised with how I present the Digital First book releases of whom I showcase time after time as a measure of joy ahead of being able to devour the books in their physical formats! It took a bit for me to realise how to navigate this changing tide of the pub world, as I originally felt that perhaps a traditional reader like me might be left behind but happily I was mistaken! Instead, I am finding a lot of readerly love from Digital First publishers, as I regularly host releases by ChocLitUK and Month9Books where I split the bookjoy between reading print editions of the Romance novels via ChocLit whilst focusing on guest author features by Month9. I do host a weekly Romance chat on Saturdays @ChocLitSaturday (all writers and readers of Romance are welcome to drop-in!) which was directly inspired by ChocLitUK inasmuch as I try to host their authors for special events and guest features as often as I can. In this unique world of publishing even traditional readers can navigate the changing tides and find a heap of joy in the stories they gravitate towards reading regularly. I am grateful Lola started to feature authors by Anaiah Press as I might not have found them otherwise, and this to me is one of the benefits of hosting blog tours, author guest features, and even Book Blitzes! For me hosting a Book Blitz is more about an ‘introductory announcement’ of a book I am seeking to read whilst giving my readers an impression of how the novel interested me at first sight. With Chapter Samplers, I am finding myself quite wicked happy authors are giving readers a snippet of a glimpse into their stories — not only to help us decide to pick up the novels themselves but to be allowed to blog about the beginnings as we elect to reach out to those who follow us about a new story we’re happy to have found. You’ll notice this isn’t my first Chapter Sampler impression I’ve blogged as I am only just getting started to bringing to my readers attention the samplers I am finding (both in ePub or audio formats)! I do list these posts in my Story Vault, because to be truthful they are my first encounter with the stories ahead of further reading. 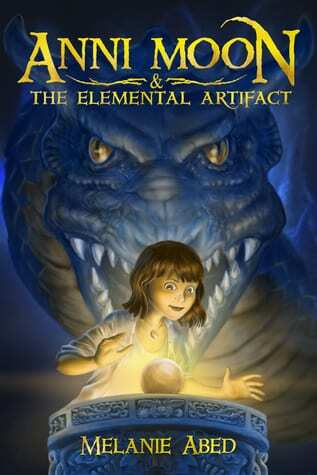 Blog Book Tour | “Anni Moon & the Elemental Artifact” by Melanie Abed an exciting #newbook for #MGLit readers who love Fantasy! Finding stories within the realm of Middle Grade is quite a happy exploration for me, as I have been happily entrenched in my local library’s catalogue for six years come May 2015! A seriously addictive hobby of mine has been to seek out wicked quality stories crafted for young minds whose innocent imaginations are thirsty for believable worlds, compelling characters, and heart-warming tales which seek to teach as much as they are to inspire! I grew up with a happy heart for learning and for expanding my knowledge as I read each new story that whet my palette of interest to soak inside, however, the offerings during the 1980s and the 1990s were a bit on the paltry side compared to the 2000s! There has been such an explosion of options within Children’s Literature, that in part, I was inspired to create a special page dedicated to reading and wandering through this ocean of choices here on Jorie Loves A Story! Originally inspired to pick up from whence I had left off in order to root out a story or two my own nephew and nieces would appreciate reading, I would in turn discover a new niche of stories that suited my curiosities and enriched my reading joy by the manner in which the authors were penning entire worlds out of everyday lessons, life affirming restitutions, and a deeper love of giving back a measure of awe-inspiring narratives that could give a child (or an adult!) a widening breadth of literary delight! Imagine then, my on-going quest to not only seek out stories inside general fiction releases but those of science fiction and fantasy as well! In fact, most of the stories I had selected to read for  Sci Fi November were between Middle Grade and Young Adult — a fact, I had not even realised until I complied the final draft for the schedule! Anni Moon was an instant curiosity simply based on the premise — a world in which magic and the artful realm of fantasy merging together to give an intrepid reader (of any age) an adventure they would not soon forget! Late in the afternoon on Wednesday, the 7th of January 2015, I suddenly realised my tour stop on the 8th was on fast approach and I hadn’t knitted together the press materials nor sorted out the excerpt which would run with my featured spotlight! Lo and behold, the publicist came through for me and I was able to receive the materials in the nick of time, however, what gave me a happy smile truly is realising I could ‘catch a preview’ of a book I dearly want to read in print! My ruminations on the chapters and pages I was able to read digitally follow shortly, as I am starting to accept limited electronic copies of stories (technically novella or short stories 20 pages or under; see my Review Policy) except to say, this particular sampler was 50 pages in length! I daresay, not even on a good day could I read so much on a digital screen! I knew I couldn’t read even the first 20 pages in such a short time between Wednesday night and Thursday afternoon, but the pages I could consume I wanted to give my honest reflections! Making this my first spotlight post wherein I give a miniature glimpse into how my reactions start to generate as I read a story currently available in ebook editions, and hopefully soon in print books! Acquired Book By: Although I was selected to participate on the blog tour for “Anni Moon & the Elemental Artifact” there wasn’t a print copy of the novel available for me to receive for review purposes. Therefore, I originally elected to host a Book Spotlight for the blog tour whilst including a book excerpt or a few quotations from the novel itself. I learnt I could receive a complimentary chapter sampler (1-6) e-book PDF copy of “Anni Moon & the Elemental Artifact” direct from the author Melanie Abed by requesting it off the author’s website by email. I was not obligated to post a review by doing so and I did not receive compensation for my opinions or thoughts shared herein. However, the life of a freelancer is not for the faint of heart. I’ve kept myself busy with my extracurricular activities, from skydiving to scuba diving, a black belt in Tae Kwon Do, a degree in Fine Art, an M.A. in Psychology (with a focus in Neuroscience), and a few other things that I like to keep top secret. …Some people think I’m a spy, but I’ll never tell!